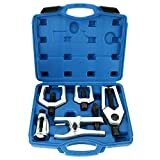 This front end service kit, including five tools made of heat-treated alloy steel, is used to remove pitman arms, tie rods, and ball joints on most vehicles. In different shapes and sizes, with great strength and durability, these pullers can remove even the most stubborn pitman arm or tie rod. The press-type ball joint separator, unlike the fork-type, will remove the ball joint without damaging the car boots or any other parts. 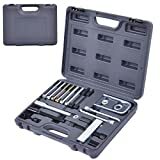 The whole tool set can be very useful for professional automobile mechanics. The Astro Pneumatic 78807 5 piece Pickle Fork Ball Joint Separator Set features solid construction pickle forks in 5 popular sizes. 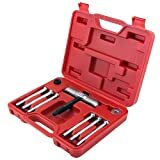 This set is used to remove ball joints, tie rods, pitman arm, and other linkages. One piece design ensures durability, rigidity, and complete transfer of hammering forces. Included are the following sizes to fit most automotive applications: Open Size – 11/16″, 15/16″, 1-1/16″, 1-7/16″, and 1-5/8″. Depth – 2-3/4″ (69.8mm), 3″ (76.2mm), 2-7/8″ (73mm), 2-3/8″ (63.5mm), and 3-1/8″ (79.3mm). Provides ultimate brute strength for disassembling even the most seized U-joints in minutes on virtually all cars, light-duty trucks, and farm machinery. – Eliminates dangerous vice and socket or hammering methods. – Can be used on aluminum driveshafts. – Does not damage the driveshaft, yokes, joints or bearing cups. – One piece unit – No bolts, cables, or assembly required. U-Joints with bearing cups 1″ to 1.25″ O.D. Note: Damage to flange style yokes may occur if bearing cups are severely seized. Not compatible with Double Cardan joints. 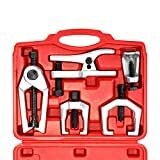 Astro Pneumatic’s 7897 Ball Joint Service Tool and Master Adapter Set includes all the receiver tubes and removing/installing adapters needed to work on press-fit upper and lower ball joints on most GM, Ford, and Dodge 2 and 4 wheel drive pickups, vans and sport utility vehicles. Comes in blow molded carrying case, keeping the tools organized and easy to transport. Astro Pneumatic’s 7868 Master Ball Joint Adapter Set Includes all the receiving tubes and removing/installing adapters needed to work on most GM, Ford and Dodge 2-wheel and 4-wheel drive pick-ups, vans and sport utility vehicles through 1997. Works on press-fit upper and lower ball joints. The set also includes live center forcing screw plug and a blow molded carrying case. 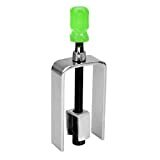 This steering wheel lock plate remover is used to simplify the removal and installation of the lock plate snap rings when servicing steering wheel columns. The extended yoke services both tilt-wheel and telescoping columns. The adapter is reversible with 9/16-Inch by 18 on one side and 14mm by 1.5 on the other. Removes the pivot pin on GM, Ford and Chrysler tilt and telescoping saginaw steering columns. Includes an extra screw. OTC’s No. 7889 Steering Pivot Pin Remover for 1969 and up GM, Chrysler, and Ford vehicles with Saginaw steering columns, greatly simplifies tilt steering column service procedures. Tool includes cup adapter, forcing screw, nut, and washer. Rugged, all metal construction ensures this versatile tool set will deliver reliable long-term service. Value is at the core of the OTC tool and equipment portfolio. For a simple repair or the most complex drivability concern, these award-winning tools universally solve problems faster, and at better value, than any other product line available. Whether it’s a specialty tool or unique piece of service equipment, OTC provides top solutions to modern automotive service challenges while increasing technicians’ productivity and shop profits. 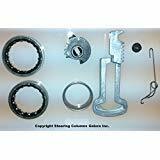 GM and Chrysler, steering columns with tilt, bearing and rack gear kit. This is our professional steering wheel remover and lock plate compressor set. It is constructed from steel with various finished fro powerful disassembly without deformation, which can provide you long service time. This is a great helper for your repairing work. And it’s suitable for most American cars and light trucks such as Crown Victoria, Town Car, Ranger and Focus. In addition, the lightweight and compact design with a suitcase allows you carry it easily and takes little space on room or you car. Do not hesitate and order one now!